The WorkForce Pro WF-8590 A3 multifunction printer, powered by PrecisionCore, saves up to 40 percent on printing costs vs. color lasers1. It delivers 13" x 19" printing, scanning up to 11" x 17", plus color and black print speeds of 24 ISO ppm. 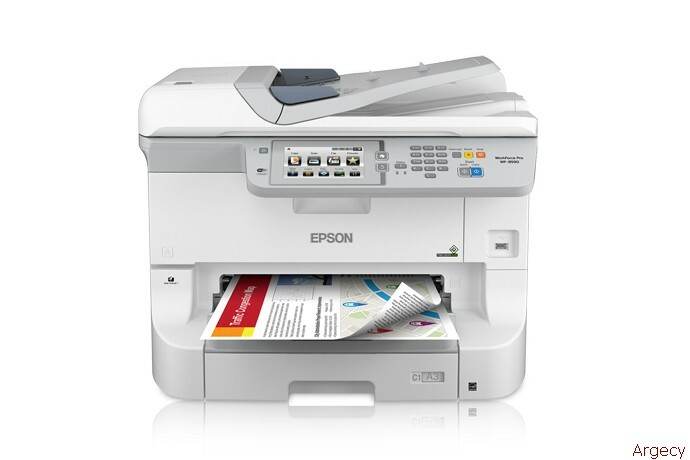 Featuring a high monthly duty cycle and ultra high-yield cartridges that print up to 7000 color page2, it's ideal for shared color printing on a network. Along with PCL3/genuine Adobe PostScript 3support, a Universal printer driver and Web Config, it's also enabled with remote printer data collection compatible with MPS software solutions. Maximum Paper Size: 13" x 47.5"
Maximum print speeds are measured with text patterns in Draft Mode on plain paper. Actual print times will vary based on system configuration, software, and page complexity. Black and color copy speeds (cpm) are determined in default, single-side mode, in accordance with ISO/IEC 29183. Actual copy times will vary based on system configuration and page complexity. See www.epson.com/copyspeed for details. Wi-Fi CERTIFIED; level of performance subject to the range of the router being used. Wi-Fi Direct may require printer software. 8 Not all media types are supported for PCL printing. 9 Monthly duty cycle up to 75,000 is the highest duty a user could expect in a month, based on near-constant operation of a device of this kind. It is not recommended that the device be run at this duty. For best device performance, run the device at the recommended duty of 5000 pages per month.